Coming off of a record 15 offerings in May, June kicks off with two new IPOs this week. According to Renaissance Capital, a manager of IPO-focused ETFs, the two deals are expected to raise a combined $102 million. These two upcoming IPOs follow last week's record-breaking U.S. Foods IPO. The deal raised $1.02 billion to become the second-largest IPO of the year after MGM Growth Properties LLC (NYSE: MGP) and the biggest deal by sales in three years. Shares of U.S. Foods Holding Corp. (NYSE: USFD) hit the market on Thursday, May 26, along with Cotiviti Holdings Inc. (NYSE: COTV), GMS Inc. (NYSE: GMS), and Reata Pharmaceuticals Inc. (Nasdaq: RETA). That makes May 26 the biggest IPO day of 2016 based on number of IPOs and total funds raised ($1.47 billion). If history is any indication, June will be another big month for the IPO market. 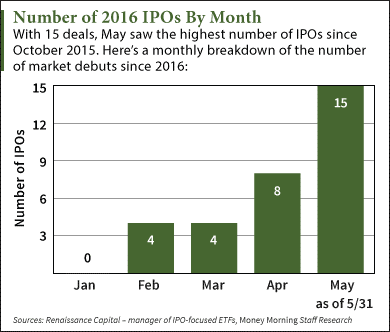 Renaissance Capital reports June is seasonally one of the strongest months for IPO activity. It had the highest number of offerings out of any month last year and the second-highest in 2014. NantHealth LLC (Nasdaq: NH) is a cloud-computing company focused on the healthcare industry. Founded in 2007, the firm offers a software that combines a person's medical data with his or her genetic information to find personalized treatments for cancer and other diseases. NantHealth is headed by Patrick Soon-Shiong, a doctor and pharmaceutical entrepreneur listed in Forbes' Top 100 Billionaires list. Despite its presence in a valuable Software-as-a-Service (SaaS) market, the company sits on a debt pile of $324 million and racked up $36 million in its most recent quarter alone. The NantHealth IPO will raise $91 million by selling 6.5 million shares at a $12.50 to $15.50 price range. The firm is valued at $1.7 billion and will hit the market on Thursday, June 2. Sensus Healthcare Inc. (Nasdaq: SRTS) develops X-ray and radiation systems geared toward treating certain skin conditions. Specifically, its devices treat non-melanoma skin cancer – which includes cancers like cell carcinoma that aren't melanoma – and keloid scars – which include overgrown scar tissue formed after an injury heals. Sensus is using its IPO to raise money to grow the company's marketing and sales operations. The company posted $10 million in sales last year. It's set to raise $11 million by offering 1.75 million shares for $6.25 each. Sensus commands an $80 million valuation and will start trading on Friday, June 3. Alex McGuire writes about IPOs for Money Morning. Follow him on Twitter for updates on new IPOs in 2016.